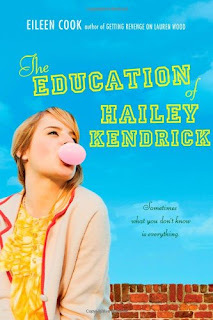 Summary: Hailey Kendrick always does exactly what's expected of her. She has the right friends, dates the perfect boy, gets good grades, and follows all the rules. But one night, Hailey risks everything by breaking a very big rule in a very public way...and with a very unexpected partner in crime. Hailey gets caught, but her accomplice does not, and Hailey takes the fall for both of them. OhMyGoodness. I've been dying to get my hands on this book for like EVER!!!! Oh yeah, I'm totally stalking your blog. That's a FACT. LOL. I sound like a total creeper. Anyway! Thanks for these awesome giveaways!! Oh lovely! I am going to go nuts entering all this giveaway! WOOT! Would love to read this! I'm a follower! Sounds like a great light-hearted read, which I could definitely use more of. Looks great on the TBR happy to see it on contest craze. I love Eileen Cook, so I know she's awesome! Thanks for a chance to win this! Thanks for the giveaway, this one looks like a light fun read! Please count me in! This sounds so good! I've enjoyed the other Eileen Cook books I've read so I bet I'll love this one too! This one looks so good. I have been trying to check it out at my library, but it has been out every time I try. Great giveaway! That's sounds awesome,too. Man you've got so many fantastic giveaways! This one sounds awesome too! This one sounds great! Count me in! Thank you for the chance to win this novel! Definitely would love to win this book! I wanted to read this since forever! oh enter me, please! thank you! This is SO on my list. want! Sounds like great book. I really want to read this. Thanks for the chance !! !